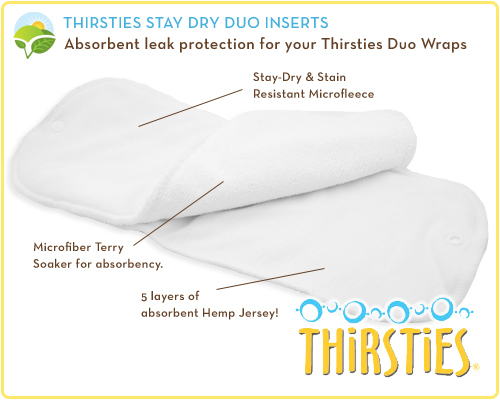 Place Thirsties Stay Dry Duo Inserts in a Thirsties Duo Wrap! The Thirsties Stay Dry Duo Inserts, designed to lay into your baby's Thirsties Duo Wrap Diaper Cover, heighten absorbency and increase baby's comfort without compromising trimness. Thirsties Stay Dry Duo Inserts are made-up of two (2) inserts - a top and bottom insert - that snap together. Paired with the Thirsties Duo Wrap the Stay Dry Duo Inserts are an affordable option for cloth diapering that is just as easy as disposables, but without the environmental impact! The Thirsties Stay Dry Duo Inserts are simple to use, easy to clean and dry quickly. Simply open your Thirsties Duo Wrap Diaper Cover and lay in the two (2) layers of fast-absorbing microfiber terry - topped with the stay-dry and stain resistant microfleece layer. Then, snap it together with five (5) layers of Thirsties' buttery-soft, hemp/jersey blend. When your baby wets, the moisture passes through the fleece layer into the microfiber terry. Baby stays dry and rash free and all leaks are contained within the leak resistant Thirsties Duo Wrap! As easy to use as a disposable, these inserts unsnap to clean thoroughly and dry quickly. The top fleece layer protects baby's skin from moisture. The blend of fabrics makes this insert highly absorbent, but trim. Pair with Thirsties Duo Wrap Diaper Cover, you can save $2000 over disposables! The Thirsties Stay Dry Duo Insert can be washed on warm or hot and placed in a dryer or hung on the line. The top insert (fleece layer) is comprised of 100% polyester. The lower insert is a blend of 55% hemp and 45% cotton. Thirsties Stay Dry Duo Inserts are made right here in the USA! 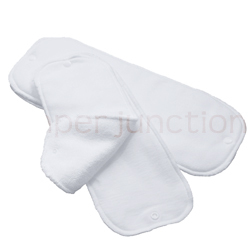 These inserts because are great because they are absorbent yet trim. I’ve had a few of these for about two months and the microfiber is starting to pill a bit but still working well. Also easy to wash and use. I actually love this insert, it is trim and holds more than I would expect. We mostly use this as a doubler with Thirsties Hemp prefolds. I have used these inserts in a few different styles of pocket diapers and have been very pleased. They are absorbent without being too bulky... I will definitely buy again. I really like to use these inside any covers and they can last my baby for like 3 hrs and still keep her bottom dry. Very easy to use even though the hemp layer may take a bit longer to dry completely in the dryer. I only ordered one of these, just to try it out, and will definitely be ordering more. The absorbency is great and the stay-dry aspect keeps baby happy. We use them mainly in our duo wraps, but have also used them in Diaper Rite newborn covers (tucking them in a bit on the ends).